It’s the season to be jolly, merry and bright. 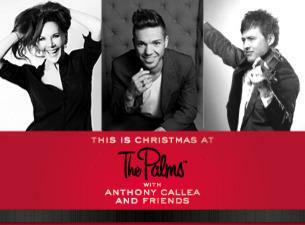 Celebrate the festive season with This Is Christmas at The Palms, featuring some of Australia’s finest talent showcasing classic songs, with spectacular dancers in an intimate setting. Join ARIA Award winner Anthony Callea and his entire band for what will be a night to remember with special guests, the beautiful Rhonda Burchmore OAM and virtuoso violinist Patrick Roberts. Anthony Callea has had a string of multi platinum, gold, number 1 and Top 40 releases spanning over a decade. One of Australia’s finest voices and with sold out national tours and international shows, Anthony is one of the most consistent and in demand performers in the country. Rhonda Burchmore OAM has celebrated 30 years in the performing arts, with lead roles in musicals in London’s prestigious West End, as well as an extensive array of productions with The Melbourne Theatre Company. Patrick Roberts embraced the violin at an early age, and at 11 years old, he was already performing at concerts. Patrick’s latest album Vision raises valuable funds for Vision Australia. Join us for your end of year celebrations, enjoy the Christmas classics and be swept away with some of Australia’s best talent. Reserve your tickets today.